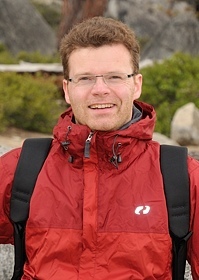 My name is Tim Huege and I work at the Karlsruhe Institute of Technology as a member of the Pierre Auger collaboration, the LOPES collaboration and the KASCADE-Grande collaboration. From April 2008 to December 2013, I led the Helmholtz Young Investigators Group Development of a Next Generation Hybrid Detector Concept for the Pierre Auger Observatory at the Institut für Kernphysik and Institut für Experimentelle Kernphysik of the KIT. As of January 2014, I am deputy group leader of the CR and Technologies group at the Institut für Kernphysik. I am the lead developer of the C++ Monte Carlo code "CoREAS" for the simulation of radio emission from extensive air showers. You can download the code as part of CORSIKA. I am also co-task-leader of the Auger Engineering Radio Array (AERA) and one of two sub-task leaders for the development of the radio extension to the Auger Offline framework. This extension provides the capability for "hybrid" analysis of data taken with AERA. For further information, see our publication in NIM A titled Advanced functionality for radio analysis in the Offline software framework of the Pierre Auger Observatory [journal] - [arxiv]. If you would like to contact me, please visit the page with my contact information.